Forman Journalism Society in collaboration with Undergraduate Mathematics Society and Alif Ailaan (Pakistan’s campaign for education reform) arranged a panel discussion on Saturday 18 March 2017. The panelist included Dr Mudassir Hussain Shah, Professor of Mass Communication at FCCU; Assistant Professor, Muhammad Adil Arshad and Moayyed Ali Jafri, a Journalist. 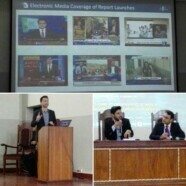 The three panelists discussed the role of media in promoting science and scientific education in Pakistani society. Roohullah Gulzari, Regional Campaign Manager for Alif Ailaan convened the discussion and shared statistics of science in Pakistan. The session was attended by students of FCCU and faculty members. The panelists were presented with souvenirs as a token of gratitude on behalf of FJS and FCCU.